The Minister stated that strengthening economic ties with the U.S. would not mean Brazil would be turning its back on other important partners, such as China. 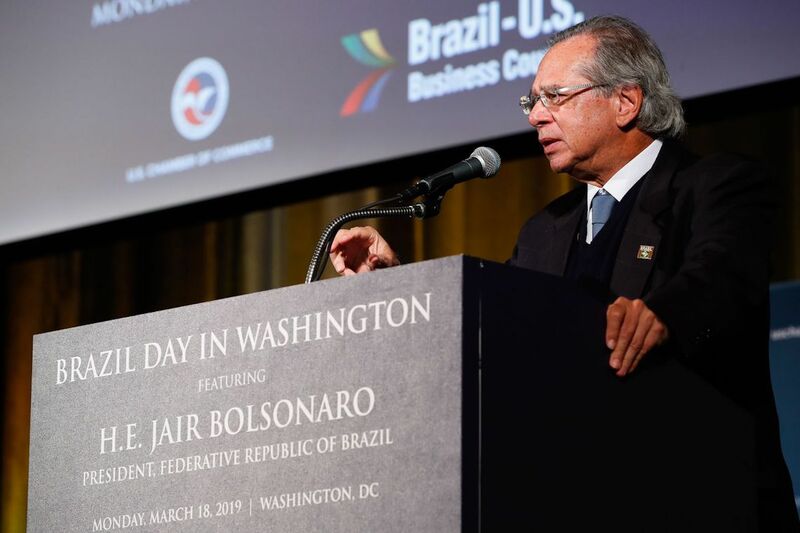 RIO DE JANEIRO, BRAZIL – Brazil is seeking economic partnerships with US businesses and opening its market to foreign investments said Brazilian Economy Minister, Paulo Guedes at a conference at the US Chamber of Commerce in Washington on Monday. Minister Guedes however said his country would not be dissuaded from trading with China. Economy Minister, Paulo Guedes, speaks to businessmen in Washington DC, photo by Alan Santos/PR. “You can go there to help finance our highways, go after oil and gas concessions, and in three, four months, we will sell the pre-salt, everyone will be there: Chinese, Americans, Norwegians,” said Guedes to a crowded room. The Minister spoke about the need for structural reforms in the country, especially the controversial social security reform, and defended the privatization of state-owned enterprises and public assets, as a way to reduce the accumulated debt of approximately R$4.3 trillion Brazil currently has. “Not only are state-owned enterprises not functioning efficiently, but hampering the growth of private investment. Public investments collapse, because of their own weight in the budget,” he pointed out. Guedes said that both the reforms and the privatizations would render excellent opportunities for both Brazilian and foreign investors. As for consolidating the economic partnership between the U.S. and Brazil, Guedes said that would be the optimal scenario for the South American country, but stated that Brazil will negotiate with whoever is willing to negotiate. He stated that strengthening economic ties with the U.S. would not mean Brazil would be turning its back on other important partners, such as China. “We do not need to reduce exposure to China, we need to trade with everyone,” he said, complaining that the U.S. government is trying to impose limits on Brazil’s deals with China. “You’ve been trading with China for decades, so why can’t we trade with them, why can’t we let them invest in infrastructure? If someone offers us a better deal we will accept, we will sell,” concluded Guedes.